LarouchePlanet sends its deepest condolences to Laurent's family and friends, to his ex-wife and daughter from his first marriage, to his widow and their daughter. This book examines contemporary jihad as a cult of violence and power. All jihadi groups, whether Shiite or Sunni, Arab or not, are characterized by a similar bloodlust. Laurent Murawiec characterizes this belief structure as identical to that of Europe’s medieval millenarians and apocalyptics, arguing that both jihadis and their European cousins shared in a Gnostic ideology: A God-given mission endowed the Elect with supernatural powers and placed them above the common law of mankind. Although the ideology of jihad is essentially Islamic, Murawiec traces the political technologies used by modern jihad to the Bolsheviks. Their doctrines of terror as a system of rule were appropriated by radical Islam through multiple lines of communication. 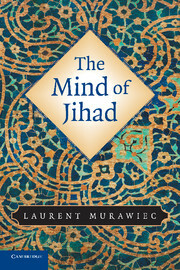 This book brings history, anthropology, and theology to bear to understand the mind of jihad that has declared war on the West and the world. Laurent Murawiec taught philosophy, was a foreign correspondent, cofounded and managed a consulting company for geopolitical and geoeconomic affairs, and taught at the ''Ecole des Hautes Etudes en sciences sociales''. He has served as a consultant for the French Ministry of Defense and as a Senior International Policy Analyst with the RAND Corporation and is currently a senior Fellow of the Hudson Institute. He is the author of La Guerre au XXIe siecle (2000 [in Chinese, 2004]), L’Esprit des Nations: Cultures et geopolitique (2002), La Guerre d’Apres (2003), Vulnerabilities in the Chinese Way of War (2004), and Princes of Darkness: The Saudi Assault Against the West (2005) as well as an acclaimed French translation of Clausewitz’s On War (1999). limitation. They were in a sense remote ancestors of Bakunin and Nietzsche. condition of humanity and to become God. revelation” was apt to feed a paranoid, delusional outlook. ignorant mankind, with considerable practical and ethical consequences. this period [the first centuries of the Common Era] its greatest efficacy. bad things are occurring. It is wrong in its principle, in the way it is organized. truth for its speculative assertions. ancient intellectual movements, specifically, he averred, in Gnosticism. Analysts who seek the “root causes of terrorism” ought to dig deeper than the surface.